In my house - especially on work days - I am a huge fan of quick and easy dinners. 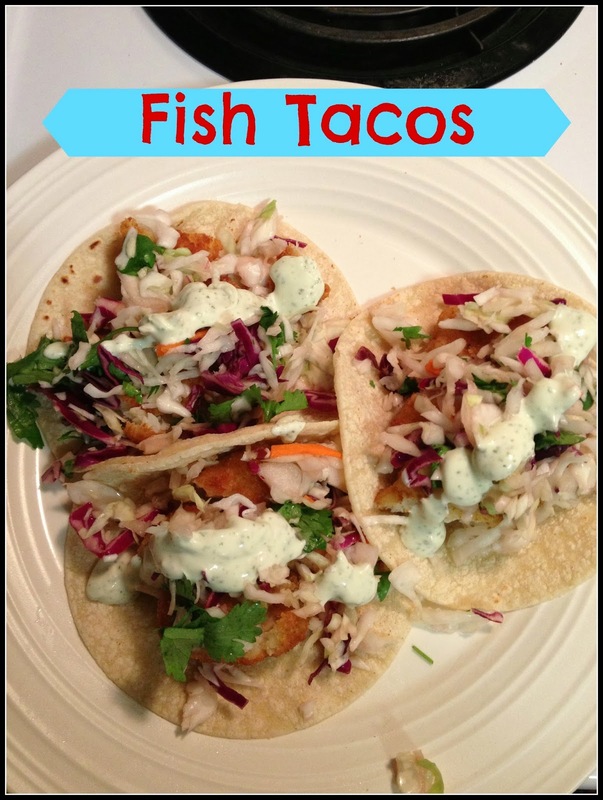 I found a recipe on Pinterest for fish tacos and it has quickly become a go to dinner that is easy and delicious. We have found (and purchased) frozen panko crusted fish (either cod or tilapia - we like both equally) at Costco. A box is around $11 and has several meals worth of fish. Throw them in the oven for 20 minutes and voila! you have crispy fish filets that are wonderful on their own with a little tartar sauce. But, they transform beautifully into fish tacos - combined with a tangy slaw, creamy cilantro lime sauce and a warm corn tortilla and you have perfection on a plate. Dissolve sugar and salt in red wine vinegar and pour over slaw. Its a small amount of dressing and a lot of slaw but it is plenty. Stir in the cilantro 5 minutes before serving. Combine all ingredients in small food processor or blender until smooth. Cook fish according to package directions. We have found that 4-5 pieces of fish (depending on their size) is enough for 6 tacos or 3 per person. Heat corn tortillas in a pan over medium high heat for 20-30 seconds on each side. Place fish on tortillas, top with cabbage slaw and drizzle lime cilantro dressing over top. *the recipe makes slaw and dressing for a several servings. We will usually do this at least two nights during the week if I make the slaw and dressing. If you make them, be sure to invite me over so I can test them to make sure you did it right. Seriously.